First and foremost, a massive thanks to the wife for dusting off her camera and helping me out with some photos this week. You may notice a small difference to the kinds of photo I usually have at this point in the week. She’s got an eye for this kind of stuff. Cheers kiddo! The wines this week, well, where to start? 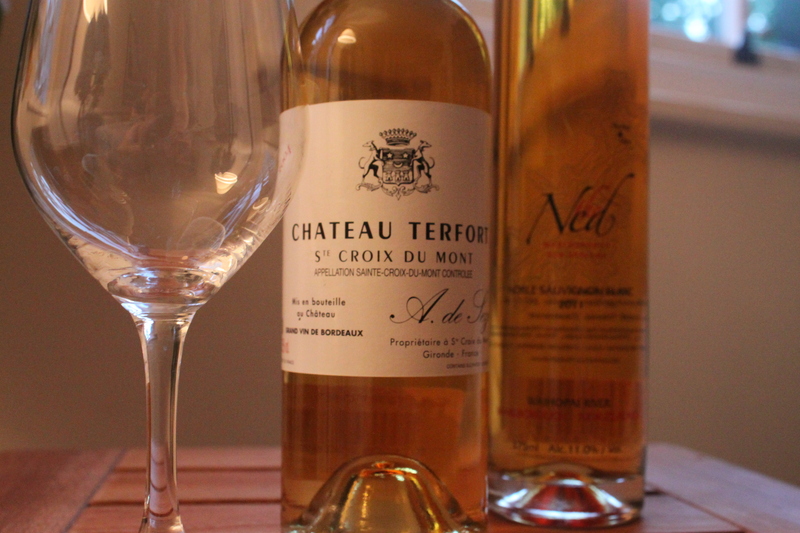 We had the Ned Noble form Majestic Wine and Château Terfort from Spirited Wines. As usually we had a little bit before hand, and then the rest with the food, a slightly messed up, but still rather tasty Tarte Tatin. 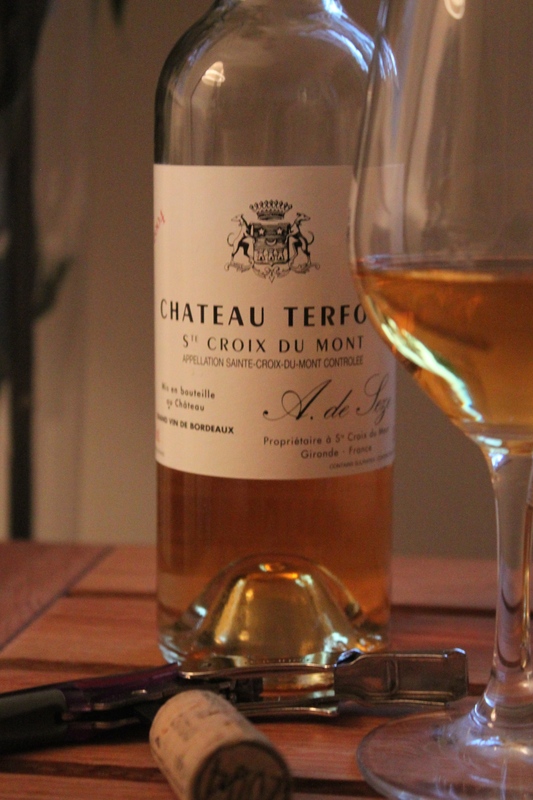 The Château Terfort, with its light golden colour, just makes you want to get stuck in. You give it a sniff and you don’t get a huge smell that you might expect, but you do get the honey and marmalade flavours from the rot, a touch of elderflower, and also I got a touch of nuttiness too. I’m thinking almond, but let’s just say nutty. It’s full bodied, it’s (only) medium-sweet, but the long finish matches perfectly with the full acidity. So easy to drink. The Ned Noble is a tad darker in colour, kind of orange caramel. You get what you’d expect I guess, slightly more dried stone fruit, in this case mangoes I thought, but the honey smell is still very much there. It was sweeter than the other, with more pronounced flavour, just as full bodied, but maybe a slight bit less acidic. The food tasted exactly what it was meant to taste like. Sweet caramel apples all packed into my very first attempt at home made puff pastry! 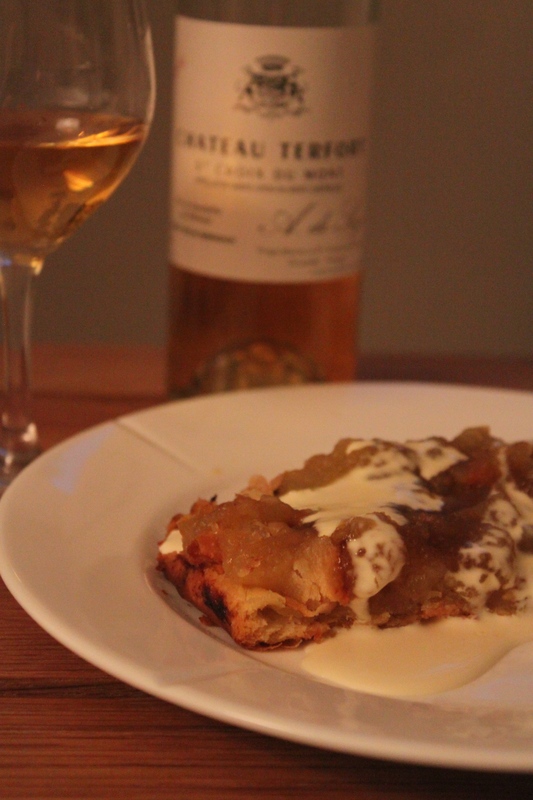 It didn’t go too badly, just as a tip, if you’re going to make tarte tatin, buy a bloody tarte tatin dish! Something always seems to go wrong otherwise. With the food I thought the Ned held its own. It was sweet enough to remain almost unaffected. The Château Terfort however was a tad more bitter with the food. I’d love to retry it with blue cheese, but it was lessened by the food this time. So, best without food for me was the Château Terfort, best with food was the Ned Noble. I think we’ll call it a draw. Both getting a very high (for me) 8/10. Yes, well done on the photos… for a change… 😉 Good stuff as usual TBH!